King is a small, rural township in York Region, home to just under 25,000 people and famous for its horse and cattle farms. It also features unique urban and rural nature, and the local community has a strong connection to the environment. If you are looking for professional tree service in King, ON, to maintain your connection with nature from your own backyard, look no further than Sequoia TreeScape. There are currently no tree preservation bylaws in place for the residents of King, and any tree on private property that is not part of a woodlot can be removed without a permit. As a result, tree removal has escalated significantly as of late, prompting town officials to reconsider their decision: As of February 2014, a relevant bylaw is being considered, renewing hope for the community’s tree canopy. We understand that it may be easier to remove a tree rather than take care of it: That is why we are here! Our tree care specialists provide regular maintenance to healthy and problematic trees alike. Should one or more die or become damaged beyond repair, rest assured that we will provide a safe and efficient removal. We will also take care of any paperwork that a future tree preservation bylaw may entail. 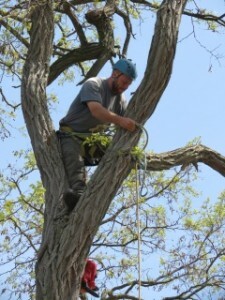 Our team possesses the advanced knowledge and experience to provide unsurpassed tree service to King Township. We are located only 25 minutes away from your home, which is why we will be there promptly – whether it be an emergency or a regular call. Tree removal is never the only option; not when you have a trained professional by your side. To learn more, call Sequoia TreeScape at Call (416)-770-8733 or request a request a free quote online today.